Under the new GST regime, the last date for filing of GST returns remains the 20th of the succeeding month. This is expected to have a significantly impact balance sheets as indirect tax receipts will be only for 11 months (excluding the receipts for March). Also, Rs 21.57 lakh crores were transferred in the form of net GST to finance the shortfalls of states against the predicted Rs 21.47 lakh. Considering the upended government spending and the above mentioned fiscal constraints, the government wasn’t able to meet its fiscal target of 3.2%. 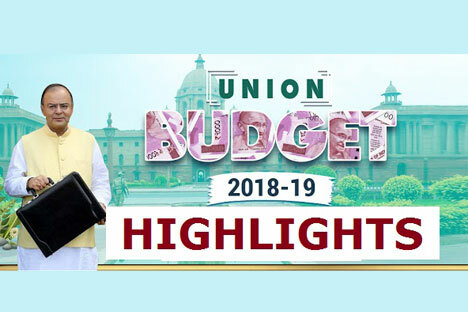 Notably, the 2018-19 targets has been set at 3.3% of GDP and the actual fiscal deficit for 2017-18 was calculated to be “Rs 5.95 lakh crore or 3.5% of GDP”. The government’s resolve to double farmers’ income, and increase production was reasserted. In a major relief to farmers, minimum support price (MSP) for all upcoming Kharif crops has been raised to 1.5 times the cost of production. “Agricultural Market and Infra Fund” with a corpus of Rs 2,000 crore will be created for 22,000 gramin agricultural markets and 585 APMCs. Also, Rs 11 lakh crore credits for the farm sector have been proposed and allocation for Food Processing Ministry has been doubled. A restructured “National Bamboo Mission” with corpus of Rs 1,290 crore to boost bamboo cultivation has been provided for. Emphasis has been given to organic farming and export of agro commodities has been liberalized to meet India’s agro exports potential of $100 billion. kisan credit cards has been extended to animal husbandry and fisheries and Rs 10,000 crores has been allocated for these domains. A favorable taxation treatment for farmer producer’sorganizations has been intended and agricultural products will now be in futures markets. A special scheme to manage crop residue and contain winter smog in the northern plains around Delhi has also been proposed. Deposit free gas connections will be provided to 8 crore poor women under the PM Ujjwala Scheme. Also, under Housing for All by 2022 and PM Awas Yojana (rural), 51 lakh affordable housing units constructed in rural and 50 lakh in urban areas. Allocation to National Livelihood Mission was set at Rs 5,750 crore and target for loans to women self-help group has been increased to Rs 75,000 crore. Extra and non-budgetary resources of Rs 14.34 lakh crore has been estimated for housing, infrastructure and livelihood in rural areas. Constructing at least 2 crore toilets under Swachh Bharat Mission has been targeted for 2018. 60 crore bank accounts under PM Jan Dhan Yojana is envisioned which is currently 16 crores. All the existing “Jan Dhan accounts”, are touted to be brought under micro insurance and pension plans of the government. Notably, “PM Jivan Jothi Bima Yojana” is currently benefiting about 5.22 crore families. It was stated that 1.26 crore bank accounts have already been opened under the “Sukanya Samriddhi Scheme” for the financial security of the girl child. Rs 52,719 crore has been allocated for social inclusion of scheduled castes. Classic IAS Academy is an age old name in the list of IAS Coaching in Delhi . Just like an ordinary stone becomes a beautiful glittery diamond after proper cutting and polishing, Classic IAS Academy honed my skills to make me a gem in the world of IAS. They made me aware of my own potential which helped me clear the IAS examination in a hassle-free manner. I would like to express my sincere gratitude to the Classic IAS Academy faculty members, who helped me sail through the rough times of preparation for this examination, in a calm and composed way.